For other uses, see Hastings (disambiguation). Hastings is a city in Dakota and Washington counties, in the U.S. state of Minnesota, near the confluence of the Mississippi, Vermillion, and St. Croix Rivers. Its population was 22,172 at the 2010 census. It is the county seat of Dakota County, which contains most of it as well as a small part extending into Washington County. It is named for the first elected governor of the state of Minnesota, Henry Hastings Sibley. The advantages of Hastings's location that led to its original growth are that it is well-drained, provides a good riverboat port, and is close to a hydropower resource at the falls of the Vermillion River. Other sites closer to the river confluence are either too swampy (Dakota County) or too hilly (Washington County and Pierce County, Wisconsin). U.S. Highway 61 and Minnesota State Highways 55 and 316 are three of the main routes in Hastings. The area around Hastings was first settled by a military detachment sent from Fort Snelling to guard a blocked shipment of supplies in the winter of 1820. A Lieutenant William G. Oliver camped in an area that would come to be known as Oliver's Grove, and in 1833 a trading post was opened there. After the Treaty of Mendota of 1851 opened the area for white settlement, Oliver's Grove was surveyed and incorporated as a city in 1857, a year before Minnesota's admission to the union. That same year Hastings was named the county seat of Dakota County. The name "Hastings" was drawn out of a hat from suggestions placed in it by several of the original founders. In the mid-19th century Hastings, the nearby city of Prescott, Wisconsin, and the adjacent township of Nininger were areas of tremendous land speculation, billed by Ignatius L. Donnelly as a potential "New Chicago". The Panic of 1857 put an end to this dream. The speculation and Panic caused the cities' growth to be less than expected given their location at the confluence of two significant rivers; today, their combined population is approximately 25,000, and all that remains of Nininger is a few buildings. Hastings is the site of the second-oldest surviving county courthouse in the state (after Stillwater), finished in 1871 at a cost of $63,000. The county administration began the process of moving to a new facility in 1974, and in 1989 the City of Hastings purchased the old building. It was rededicated in 1993 as City Hall. In 1895 a spiral bridge was built over the Mississippi River, designed to slow down horse-drawn traffic as it entered downtown. The novel design became a tourist attraction, but the bridge was demolished in 1951 because it could not handle modern vehicles. In 1930, the Army Corps of Engineers completed Lock and Dam No. 2 at Hastings, part of the canal lock systems on the Mississippi that stretch from Minneapolis to St. Louis. Lock and Dam No. 2 is the site of the nation's first commercial, federally licensed hydrokinetic power facility, a partnership between the City of Hastings and Hydro Green Energy, LLC of Westmont, IL. Fasbender Clinic, designed by Frank Lloyd Wright, is a city landmark. Hastings had its name affixed to two major Minnesota railroads, the Hastings & Dakota Railway and the Stillwater & Hastings Railway. In 1867 civic leaders William LeDuc, John Meloy, Stephen Gardner, E. D. Allen, and P. Van Auken—with financial backing from investors John B Alley, Oliver Ames, William Ames and Peter Butler—incorporated the Hastings & Dakota Railway with the goal to "cross the Rocky Mountains and meeting the Pacific Ocean". During the 1870s the H&D was completed from Hastings all the way to the South Dakota border at Ortonville. During this time, the H&D became part of the Chicago, Milwaukee & St. Paul Railroad (Milwaukee Road) and become known as the H&D Division of the Milwaukee Road. The H&D also built the famous "Lake Street Depression" in Minneapolis, which gave the H&D two districts around Minneapolis and St. Paul: the south district from Hastings to Cologne via Chaska, and the north district from Hastings to Cologne via St. Paul/Minneapolis. While the H&D never made it to the Pacific on its own, the H&D Division became the mainline of the Milwaukee's Coast Extension to Seattle, which the Milwaukee completed in 1909. In 1880 a new branch line called the Stillwater & Hastings was built between the two cities, which funneled logging and agriculture products from Stillwater to Hastings, allowing Hastings to become an important railroad switching hub. In 1882 the Milwaukee Road gained control of the S&H and operated it as a profitable branch line. The Milwaukee abandoned the entire S&H line in 1979, one year short of its 100th year of service. Today, the entire north H&D district remains intact from Minneapolis to Ortonville—except for the Lake Street Depression—and is operated by the Twin Cities & Western Railroad from Minneapolis to Hanley Falls and by BNSF Railway between Hanley Falls and Ortonville. Nearly all of the south H&D district was abandoned over time, with the last section between Shakopee and Cologne abandoned in the early 1970s. 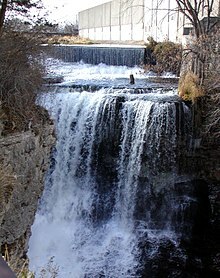 The Canadian Pacific Railway spur from downtown Hastings to the Ardent Mills mill atop the Vermillion Falls is all that remains of the south H&D district. The old H&D trestle over the Vermillion River at Hastings — which was replaced four different times — is now part of a bicycle path. The H&D bridge over the Minnesota River at Chaska remained until 1995, when it was removed by the Army Corps of Engineers as the Chaska levees were rebuilt. Canadian Pacific Railway now operates the former Milwaukee mainline through town as well as the Ardent Mills spur. According to the United States Census Bureau, the city has a total area of 11.18 square miles (28.96 km2); 10.24 square miles (26.52 km2) is land and 0.94 square miles (2.43 km2) is water. The Mississippi River forms most of the northern border of Hastings, while the Vermillion River flows through the southern part of town, over a falls adjacent to a ConAgra grain elevator. Bluffs lie along the northern shore of the Mississippi River and there is a gorge surrounding the Vermillion River below the falls. Hastings is home to two small lakes, Lake Rebecca and Lake Isabel. Both drain into the Mississippi River. The northeast corner of town is known as "The Bottoms"; an area of soggy marshland and flood plain for the Mississippi and Vermillion Rivers. Hastings is on the Mississippi side of the confluence with the St. Croix River, so that the St. Croix is "across" the Mississippi River. The city of Prescott, Wisconsin is located on the Wisconsin side of the confluence. As of the census of 2010, there were 22,172 people, 8,735 households, and 5,802 families residing in the city. The population density was 2,165.2 inhabitants per square mile (836.0/km2). There were 9,222 housing units at an average density of 900.6 per square mile (347.7/km2). The racial makeup of the city was 94.1% White, 1.6% African American, 0.5% Native American, 0.9% Asian, 0.8% from other races, and 2.1% from two or more races. Hispanic or Latino of any race were 2.6% of the population. There were 8,735 households of which 34.1% had children under the age of 18 living with them, 50.0% were married couples living together, 11.6% had a female householder with no husband present, 4.9% had a male householder with no wife present, and 33.6% were non-families. 27.7% of all households were made up of individuals and 11.9% had someone living alone who was 65 years of age or older. The average household size was 2.45 and the average family size was 2.98. The median age in the city was 37.5 years. 24.7% of residents were under the age of 18; 8.1% were between the ages of 18 and 24; 27.4% were from 25 to 44; 26.3% were from 45 to 64; and 13.6% were 65 years of age or older. The gender makeup of the city was 49.2% male and 50.8% female. As of the census of 2000, there were 18,204 people, 6,642 households, and 4,722 families residing in the city. The population density was 1,798.2 people per square mile (694.5/km² ). There were 6,758 housing units at an average density of 667.6 per square mile (257.8/km²). The racial makeup of the city was 97.16% White, 0.43% African American, 0.38% Native American, 0.64% Asian, 0.04% Pacific Islander, 0.36% from other races, and 0.99% from two or more races. Hispanic or Latino of any race were 1.14% of the population. There were 6,642 households out of which 37.4% had children under the age of 18 living with them, 56.8% were married couples living together, 10.6% had a female householder with no husband present, and 28.9% were non-families. 22.8% of all households were made up of individuals and 8.5% had someone living alone who was 65 years of age or older. The average household size was 2.64 and the average family size was 3.13. In the city, the population was spread out with 27.3% under the age of 18, 8.9% from 18 to 24, 30.6% from 25 to 44, 21.5% from 45 to 64, and 11.7% who were 65 years of age or older. The median age was 35 years. For every 100 females, there were 99.8 males. For every 100 females age 18 and over, there were 97.7 males. The busiest route in Hastings is U.S. Highway 61, which in Hastings is also known as Vermillion Street. Highway 61 is a four lane thoroughfare that cuts through the eastern side of the city in a north–south direction. Following Highway 61 north out of Hastings takes you over the Mississippi River via the Hastings High Bridge to Cottage Grove and eventually the city of Saint Paul, and taking Highway 61 south brings you to Red Wing. The current bridge, which carries 32,000 vehicles per day and is the busiest two−lane bridge in the state of Minnesota, Construction started on a new four lane bridge in late 2010 and was completed in 2013. The other major route in Hastings is Minnesota State Highway 55; the main east–west roadway. Highway 55 is also a four lane highway that enters the city from the west and cuts through the middle of town where it eventually comes to an end at Highway 61. Highway 55 is a major commuter route for residents of Hastings, taking them northwest to Eagan and eventually to the city of Minneapolis. Highway 316 is a 10-mile highway that starts at Highway 61 in southern Hastings and heads southeast to Welch Township. It acts as a more direct shortcut between two points of Highway 61. Highway 316 is located just west of the Mississippi River. Highway 316 and adjacent Highway 61 are both part of the Great River Road. Highway 316 is also known as Red Wing Boulevard and Polk Avenue at various points throughout its route. Highway 291 (Minnesota Veterans Home Highway) is a short, one mile roadway on the east side of Hastings that lies host to a Minnesota Veterans Home. Highway 291 is also known as East 18th Street and Le Duc Drive in Hastings. The roadway crosses the Vermillion River. On the same site of the Veterans Home is a drug and alcohol treatment center, formerly known as Cochran Recovery Services, which is now being managed by NUWAY. Other routes that lead into Hastings are Dakota County Roads 42 (northwest side of town), 46 (southwest), 47 (southwest) and 54 (east). Hastings is not served by the Metro Transit public transportation bus routes, but preliminary studies are underway to bring commuter rail to Hastings via the Red Rock Corridor. Amtrak trains pass through, but do not stop in Hastings (Prospective passengers must go north to St. Paul or south to Red Wing to board). The Mississippi River in Hastings is a major thoroughfare for barges, and they are helped upstream by Lock and Dam No. 2 on the northwest side of town. There are several access points to the Mississippi River for private watercraft. Hastings Public Schools operates public schools. ^ Minnesota; a state guide. New York: Viking Press. 1938. p. 298. Retrieved July 13, 2010. ^ Upham, Warren (1920). Minnesota Geographic Names: Their Origin and Historic Significance. Minnesota Historical Society. p. 165. ^ "US Gazetteer files 2010". United States Census Bureau. Archived from the original on February 20, 2011. Retrieved November 13, 2012. ^ "Daily Normals of Hastings, Minnesota". National Climatic Data Center. Retrieved April 12, 2006. ^ United States Census Bureau. "Census of Population and Housing". Retrieved November 2, 2014. Wikimedia Commons has media related to Hastings, Minnesota. This page was last edited on 20 April 2019, at 04:08 (UTC).